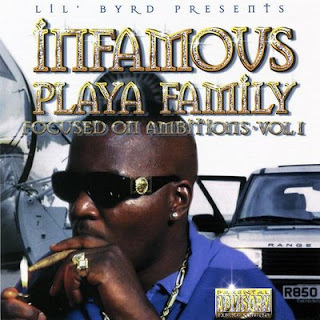 Infamous Playa Family, also known as IPF, is a group from Houston, TX. It consists of Lil' Byrd, Tay-Day, Bino, B-Dub, Drew, Kickdou and Yung Hilton. This is their debut album and it was released in 1999 on Game Tite Records. The dope production is done by Lil' Byrd, Mr. Lee and Tommy Franklin. Beats are a constant display of straight Texas funk. They inflict thumping bass lines along with some head bopping samples. Lyrics are refreshing and complex. All members grace the mic extremely well and their flows are somewhat rapid. Featuring on the record is T-Boy, Klas' One and Droopy. Since the release of this album, IPF has gained large amounts of success with their original sound. The group is still going strong today and has collaborated with many known names from the south. Also, member Lil' Byrd has released a couple of solo records. * This is the re-issue, the original was released in 1998 with a different cover.